The Iowa 80 Truckstop is one busy place. The world’s largest truck stop, located at the Walcott interchange of Interstate 80, serves 5,000 customers per day. And many of those people visit its busy eatery, Iowa 80 Kitchen, which serves two million cups of coffee and 18 million eggs every year. The restaurant was especially full of customers on June 4 when it celebrated its 50th anniversary with throwback menu pricing from the year it opened. “All of the managers got together, and we wanted to do something fun,” said Chris Hahn, a restaurant shift manager whose grandparents, Ruth and Bill Peel Sr., founded the business. “We figured we’d do an appreciation event for the customers who have been with us for so long,” she said. So on June 4 coffee at Iowa 80 Kitchen sold for a dime just like it had five decades earlier. Two eggs, hash browns, toast and bacon or pork sausage went for 95 cents. A cheeseburger and French fries were 55 cents. And half of a fried chicken, choice of potato, coleslaw and roll were $1.65. Those prices surprised Hahn, who wasn’t yet around in 1964. Now one of the area’s largest restaurants, Iowa 80 Kitchen began, you might say, as a 23-seat snack bar at a bowling alley on Black Hawk Road in Rock Island. The late Bill Moon, who was working for Standard Oil, heard about the Peel family from a restaurant supply company and stopped by the snack bar during the summer of 1963. He told them he was looking for someone to run a restaurant in a truck stop that Standard would be building north of Walcott along what then was a fledgling Interstate 80. Moon then drove the family to the site of the future truck stop, Bill Peel Jr. related in The Perfect Spot, a book Iowa 80 Truckstop published 10 years ago to commemorate its 40th anniversary. “But at that point in time, it was just a cornfield,” Peel recalled. Y40 was a gravel road and, as yet, there was no overpass. Moon, a visionary, “did a pretty good sales job,” Peel noted, and convinced the family to operate the restaurant when the truck stop was built. The first Iowa 80 restaurant was quite cozy. It had just 50 seats and a six-seat counter. There were no hand-carried menus back then. Meals were listed on a menu board with push-in letters and numbers. It could be read from anywhere in the room. But since its 1964 debut, the place has expanded regularly. 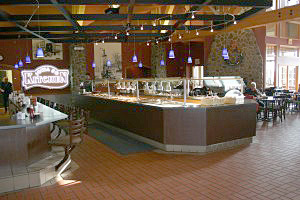 The first expansion came just a year after it opened and took it from 50 seats, not counting the counter, to 150 seats. Today there are 300 seats and a horseshoe-shaped, 50-foot salad bar in a 5,693-square-foot facility that recently received a facelift. While Iowa 80 Kitchen’s prices in 2014 are higher than they were in 1964, one thing hasn’t changed. The place is still a family operation with the third generation of Peels now in charge. Bill Peel Jr.’s son, Chris Hahn’s cousin Jeff, operates the restaurant and shares ownership of it with his mother, Beverly. Copyright 2014 by Phil Roberts, Creative Enterprises. Submitted as a column to The North Scott Press.